There's a balance somewhere between having things in our home and being swamped by what we have, writes life coach Jan Aitken. After a couple of years of having some of my belongings in storage, I've finally been able to bring the boxes home. Funny thing was, I couldn't remember what on earth I had in the majority of them! That got me questioning if I really needed to keep it all. After all, if I hadn't missed it, did I really need it? We live in a culture that sends the message that acquiring things is good, but I think I probably have more stuff than I really need. That's OK, up to a point, but when we get our new purchase home and have nowhere to put it, then it's time to take stock and have a think about what's going on. It may also be time to have a de-clutter. Even small amounts of clutter can crowd our lives. There's a lot of physical and mental energy involved in maintaining belongings. Small items need small amounts of care, but it all adds up. Remember, the more you have, the more energy it takes to maintain. The emotional toll can become a burden as well. When stuff overruns the home, you can start to feel isolated, perhaps you're too embarrassed to invite people in or entertain friends. The more things accumulate, the harder it is to get anything done and the more overwhelming it gets. There are proven links between physical clutter and depression, anxiety, loss of creativity, lower satisfaction levels with life in general, diminished health and wellbeing and higher levels of unhealthy eating - the opposite of what we are led to believe acquiring things does for us! Back when fire was a novelty, our brains were hardwired to acquire food and shelter whenever the opportunity arose. Nowadays most of us have a firm grip on those, but our brains still want us to acquire and that's where buying comes in. We reward ourselves with shopping, we buy to impress, to feel secure and because we are scared to miss out on the latest trend. Marketers and advertisers know this and exploit our fears, encouraging us to buy, buy, buy. But wait, there's more ... social media even tracks us online and delivers advertising to our screens that's specifically matched to our previous searches. I'm not advocating a minimalist approach to life, but there's a balance somewhere between having things in our home and being swamped by what we have. Where that point is is different for all of us. However, if your belongings are causing distress or arguments then it's probably time for a rethink. Streamlining does have its advantages, not just as a housekeeping tool, but as an essential process for maintaining happiness at home and at work. Before you decide to clear out a few things, ask yourself if you have used it in the past year? Do you really love it? Do you have somewhere to put it? Would you buy it again? With those questions in mind, take a room-by-room approach with the ``rubbish box rumba'' - for each room have a ``put back box'', a ``give away box'', an ``other room box'' a ``rubbish box'' and a ``recycle box''. First, if an item belongs in the room you're in, but is out of place put it in the ``put back box'' (clothes on the floor of the bedroom etc). Second, items you don't use, haven't used in a year, don't love or wouldn't buy again go in the ``give away box'', so someone else can get some use or joy out of stuff you don't want anymore. Third, if an item doesn't belong in the room you're in put it in the ``other room box'' and deal with it later. Finally, anything leftover that can't be recycled goes in the rubbish box. I have rediscovered some treasures and they are now on display, but I also discovered an awful lot that I hadn't missed. So you’ve decided it’s time to clear a few things out. 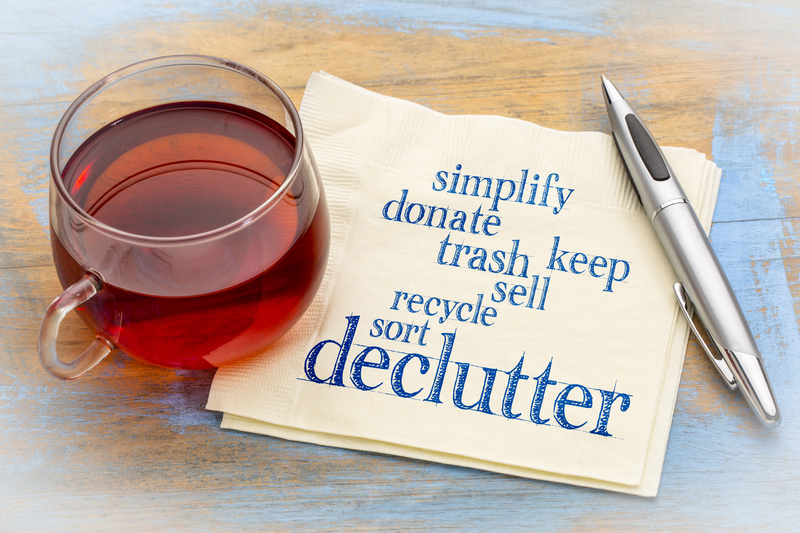 Just know, even when you consciously decide to de-clutter it can still be a tough job to do. • Do I use it, or have I used it in the past year? • Do I really, really love it? • Do I have somewhere to put it? • Would I buy it again? • Do I have the space for it? • How often will I use it? • Do I really love it? feel better? If so, there’s probably other emotional or personal needs that need to be met, it might be worth working on those.